Summer is here and many of us are thinking about how we can keep our kids safe in the sun. Parents and nannies everywhere are grabbing the sunscreen. 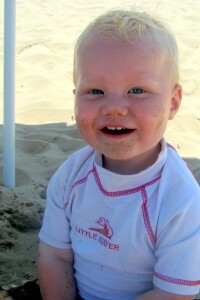 Some sunscreens out there are made of chemicals that you may not want on the little ones. There are natural sunscreens that are just as effective. Using safe ingredients, many lotions, creams and sticks provide excellent UV protection while minimizing chemical exposure. TLC For Kids has made a list of some of the natural sunscreens that were included in The Environmental Working Group’s (EWG) annual Safe Sunscreen Guide. Many of these products can be found locally and can be found online as well. Remember sunscreen isn’t your only defense against the sun. Wear protective clothing and hats to avoid a sunburn. TLC For Kids in St. Louis is recruiting for part time nannies. We have great families in need of after school nannies. An after school nanny is a great job for a college student. The job allows you to go to morning and early afternoon classes AND be back on campus for study groups or club meetings in the evenings. After school nannies typically work Monday through Friday 2/3pm to 6/7pm. You may pick the kids up from school or meet them at the bus stop. Once the kids are home after school nannies help with homework, take the kids to activities, play ball, or supervise a little down time. After school nanny jobs are a great way to work consistent hours while focusing on your schoolwork. Summer vacations are a lot of fun for everyone. Kids love traveling to new places and seeing all the cool things a different city can offer. If your kids are like my kids, one of the most fun things about a vacation is the hotel. I don’t know why, but most kids the idea of staying in a hotel for a few days. TLC For Kids can help! We offer hotel babysitting in St. Louis, Mo. Our Miami office offers hotel babysitting in Fort Lauderdale and Miami! Our hotel sitters are fun, reliable and screened. They will come to the hotel with games and activities for the kids to do while you enjoy an evening out. It is not easy being a mom who has to juggle work and family. Here are some tips for mom to help balance work and family life. Knowing that your little ones are safe and sound at home with a loving nanny helps going to work so much easier. TLC For Kids can help you find a loving, reliable and fun nanny to watch your kids while you are gone. Try to focus on how your job is benefiting the family instead of what you are missing while being at work. Make mornings less stressful by doing as much as you can the night before. Pack lunches, pick out clothes, and plan what you are going to have for breakfast the night before. Create one calendar for everyone to use. Add school events, sports activities, and work requirements so everything is in one central place. Remember when you are at home to try to focus on being at home with your family. Plan fun family activities that the kids will like. As kids get older the needs of the family change. The family you are working for no longer need you to plan play dates, work on gross motor skills, and work on imaginative play. Instead you are needed for house organizing, chauffeuring duties, and homework help. TLC For Kids places nannies in full-time Household Manager positions. I came across these tips from the Regardingnannies.com blog. Understand that you won’t be punching a time clock. While you may be used to starting when the parents leave in the morning and being done when they come home, the role of a Household Manager isn’t so black and white. An urgent repair may require a vendor call at 7 am, a delivery may have truck trouble or get stuck in traffic, and will now arrive at 8 pm. It all requires flexibility, lots of patience, and the ability to think quickly, problem solve and multitask. If you work more than forty hours in the work week you will be compensated for overtime. Be Organized. Keeping an accurate and detailed calendar is a must. I keep a paper calendar for quick reference on my desk, as well as notes on what tasks were completed that day, follow ups to be done and general notes to self. I also utilize Gmail and their calendar is great as it syncs with my cell phone and I can color code vendors, school, work and personal appointments. The capability to keep notes on the appointment is a plus as well. Technology is your friend! Get to know the latest apps available to help with organization, time management, note taking, mileage tracking and more. Clearly define your work agreement. We highly recommend a detailed work agreement. Since you be doing childcare and household managing make sure the contract covers both. The contract should clearly define all of the responsibilities and include which role plays a priority in special circumstances, such as sick child, vacations, and inclement weather. Remember to be flexible. Not every day goes as planned. If you are interested in learning more about Household Manager positions please contact us. One question TLC For Kids hears from families when hiring a nanny, “Is how long is she going to stay?” We tell families there are reasons why a nanny might leave that are out of your hands. However, there are things a family can do to help a nanny feel comfortable in her position and happy with her job. Thank you to Kathy Webb of HomeWork Solutions for sharing this with everyone. TLC For Kids has been placing nannies for over 25 years. Contact us to learn more hiring a nanny. We all know it will happen. One day your little ones will come up to you and say they are bored. We can fix that! Make an I’m Bored Jar. I saw this idea on Pinterest and love It! We made one at our house and the kids are enjoying it. It’s easy to use. If someone in bored they can pick from the jar. They can only pick once. So, they could get make their bed, wash the windows, run through the sprinkler or make smoothies! Some ideas are fun and some aren’t. But the idea is that they have something to do. So far we haven’t picked a chore yet but I know it’s coming. Here is a link for other ideas to fill your jar. Please share with us your favorite beat the boredom. Are you interviewing for nanny positions? If so, chances are the family may want to set up a phone interview. The phone interview helps makes a large group of candidates more manageable. Typically, phone interviews are held prior to a face-to-face interview and last about 10-15 minutes. 2. The family will probably go through their schedule and job requirements over the phone to make sure they still fit your needs. 3. Know the family’s salary range and be prepared to tell them what you are looking for in terms of a salary. 4. Have a list of references and their contact information handy in case they ask. 5. Make sure you have your calendar with you so you can set up a face-to-face interview if asked. TLC For Kids has great nanny jobs. Apply on line today!